For regular travellers seeking power, style and mobility, it's an outstanding compact laptop. Asus has continued building its popular ultra-portable laptop line with its U36JC-RX197X. Blending fantastic design with impressive power and portability isn't an easy task, but Asus has done it with aplomb, making this a fantastic option for those after non-compromised portability. Weighing in at 1.6kg, this light machine is a pleasure to carry around all day. The 395-minute battery life is also impressive, narrowly beating the HP Pavilion dm4, and will keep you productive on the road for over six hours. The chassis boasts excellent build quality, with everything from the lid to the panels offering barely any flex under pressure. This makes it suited to life on the move and provides great protection for the internal components. The unusual matt-black finish hides dirt and smudges well, but also looks and feels fantastic. The excellent build quality extends to the keyboard, which, similar to the Lenovo IdeaPad Z560, provides easy typing action. We worked with office documents for hours on end with the Asus U36JC, and found the keyboard to be firm and intuitive to use. An impressive feat, considering the diminutive size of the chassis. The 13.3-inch screen features a 1366 x 768-pixel resolution, and images are sharp and detailed. We noticed a yellow tint to the panel, however, which means photos and films don't look their best. But as this laptop is designed primarily for the business market, rather than creative industries that need precise colour reproduction, this shouldn't be an issue. Asus has managed to cram a powerful Intel 2.66GHz Core i5 480M processor and 4096MB of RAM into the tiny chassis, and the result is an impressive performance – especially considering the diminutive form factor. You'll be able to smoothly multitask any number of applications, so the Asus U36JC laptop is ideally suited for those who need great performance and portability. The same can be said for the Nvidia GeForce 310M graphics chip, which features Optimus technology. 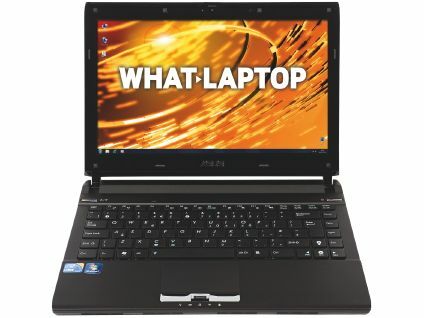 Although this ultra-portable laptop doesn't provide the level of performance of the Samsung P580 or Acer Aspire 7741G, those looking to edit photos and even HD video are catered for. A host of decent features include Asus' ExpressGate software, a quick-booting operating system for viewing the web and your emails, as well as USB 3.0, which is great for transferring high quantities of data to a compatible external hard drive. We immensely enjoyed our time with the Asus U36JC and, while it won't suit those after a big-screen laptop, for regular travellers seeking power, style and mobility, it's outstanding.